Saturday night stung. A loss by three on the road to a top-5 team shouldn’t eliminate Oregon from the College Football Playoff hunt (though it makes the road significantly more difficult), but it sure feels like this was a missed opportunity. 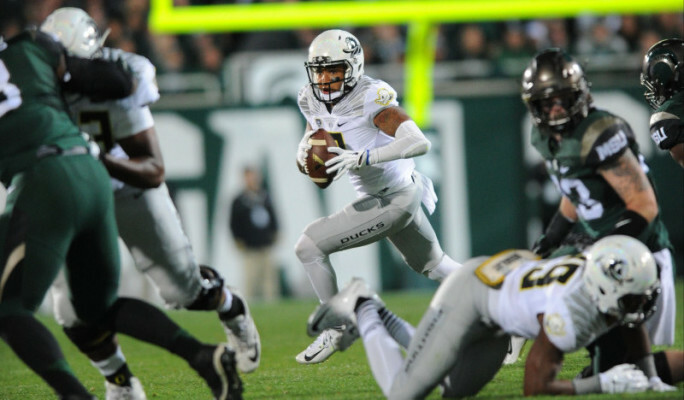 Duck Sports Authority’s AJ Jacobson wrote a recap of the game published this Sunday detailing exactly how the Spartans felled the Ducks in this early-season marquee matchup. Oregon struggled through offensive lulls after a quick start. On the game’s opening possession, the Ducks put together an impressively balanced 13-play drive capped by a touchdown run from Royce Freeman. After that, the offense struggled to get going, failing to score until the beginning of the third quarter. It should be noted that the Ducks were stopped on a 4th-and-goal from the MSU one-yard line in the second quarter, but this offense struggled in ways Duck fans aren’t particularly familiar with. Poor decisions by Adams hurt the Ducks against a talented Michigan State defense. The player manning the offensive helm, Vernon Adams, showed his promise of future stardom but also showed areas that needed improvement. Adams’ biggest issue in this game was pressing and trying to do too much. Of course this is understandable given the environment, which was unlike any Adams had ever experienced. But he needs to use this opportunity to learn from his mistakes and show those corrections against Georgia State. He held onto the ball too long and forced some throws to receivers that simply weren’t open, resulting in two costly interceptions. Adams will need to learn that at this level, defenses like Sparty’s will make you pay more often than not for mental mistakes. Another example came on the final drive of the game, one play after Adams missed a wide-open Byron Marshall, who would have walked into the end zone had the pass been on target. After missing this throw on second down, facing a third-and-six on the edge of field goal range, Adams made two crucial mistakes and yet his overall play leaves a lot to both admire and desire. Adams will have to settle down over the next few weeks before heading into the difficult stretch in November. However, and this is crucial, credit must go to Michigan State’s defense for the aggressive play call on third down, but this was yet another missed opportunity by the Ducks in a game full of plays that were there for the taking. This is not meant to be a post mortem on the season or the Vernon Adams era of Duck football. 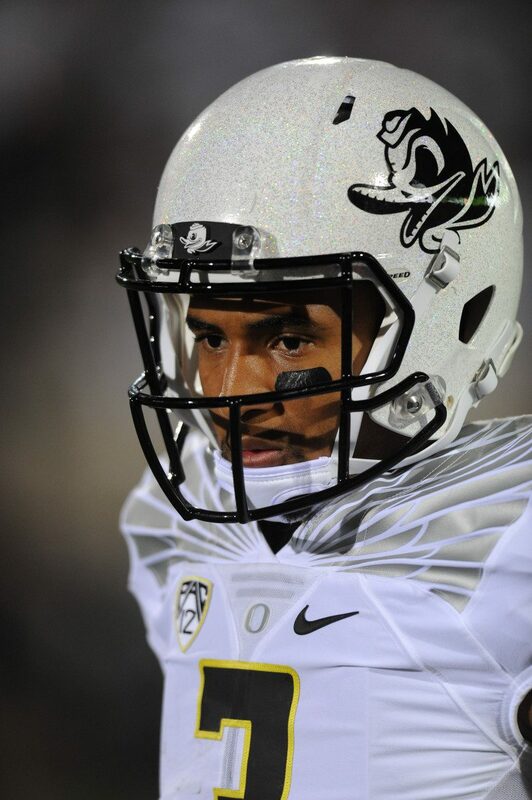 I fully expect Adams to recover over the next five weeks, in which Oregon faces favorable matchups. His issues with pressing should wane going forward as Adams becomes more comfortable with the playbook and his weapons. He will learn to feed Charles Nelson, Bralon Addison, and Freeman (all of whom stood out on Saturday) and to get the ball out of his hands quicker. As for his ability to stretch the field with the deep ball, Adams will improve in that area as his index finger on his throwing hand heals. As former Ohio State QB and ESPN analyst Kirk Herbstreit pointed out, the index finger is the “rudder” while throwing the football, as it is the last finger to leave the ball. If the index finger is injured, velocity, accuracy and spin are all affected. This was evident Saturday, as several of Adams’ passes were wobbly and under thrown. Moving forward, I expect Adams to improve his accuracy as the finger heals and also improve his comfort level in the pocket. This was by no means a bad performance, but instead something to learn from. His starting spot should not be questioned, especially if he continues to make plays like this. Oregon faces the Panthers, Sun Belt Conference bottom-feeders, this Saturday in a game that should be little more than a formality for the Ducks. Look for Adams to return to form (provided the finger does the same), put up a ton of points early, and get some much needed rest prior to the Pac-12 opener against Utah on September 26 in Eugene.